License note: Database Oasis Basic Edition is licensed per computer. The Professional Edition server is licensed for one computer, however, additional clients are licensed by user. The base license comes with three users. Additional users are $25 each. You are constantly at the center of a vortex of important information -- so how do you keep track of it all? Does your vortex swirl contain bits of sticky notes, some spreadsheets, a favorite photo or two, and a mess of documents? Do you find yourself descending into madness trying to cope with it all? Why not tie it all together in a database, courtesy of Database Oasis? 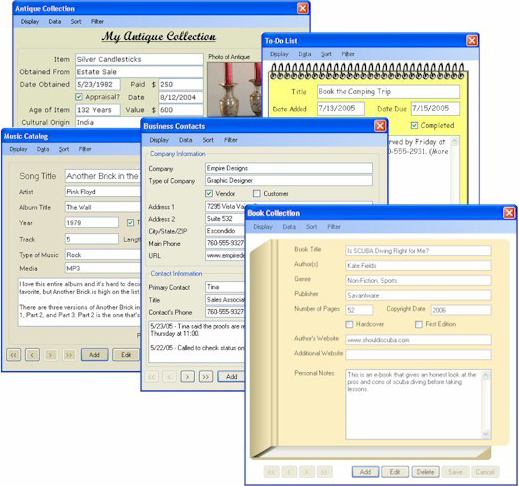 Database Oasis is a simple and easy-to-use database application that'll have you up and running in just a few clicks. Seriously -- just pick the types of data you'd like to display, the way you'd like to see it... and voilà, a custom database with no programming required! Whether you're an individual looking to tidy up a messy information situation at home, or a business that needs support for multiple users and custom reports, there's a flavor of Database Oasis that's just right for you. And don't worry about having too much data -- Database Oasis supports up to 4 Terabytes of information! Database Oasis gives you the freedom to design your database exactly how you like it. Drag fields onto a form. Add boxes and graphics. Pick some wallpaper or a background color. Go crazy with fonts and colors until your Database Oasis database is just so uniquely YOU. There are field types to enable you to keep track of almost everything in your life -- text, numbers, notes, dates, lists, photos -- you can even have calculated fields that self-populate depending on the contents of other fields. 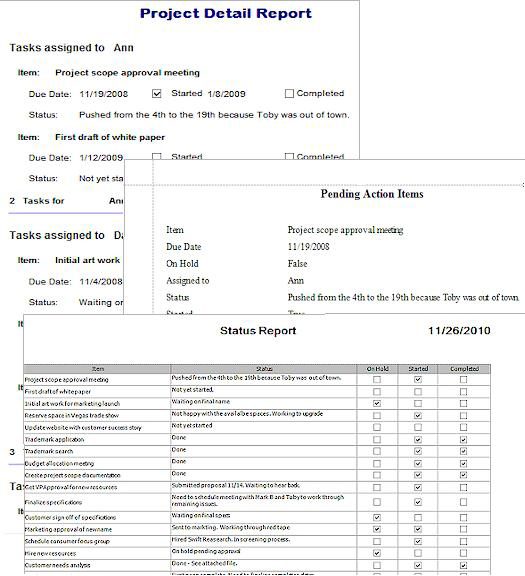 When it comes time to print out reports, you have the option of exporting reports to a variety of file formats, and can post them to a web page or email them as an attachment. 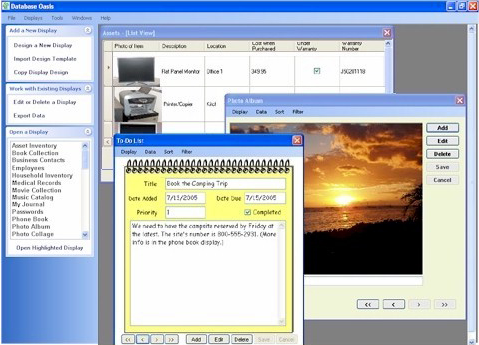 Database Oasis gives you support for everything a home user would need -- address lists, phone numbers, recipes, medical records, household stuff, photos, and more. 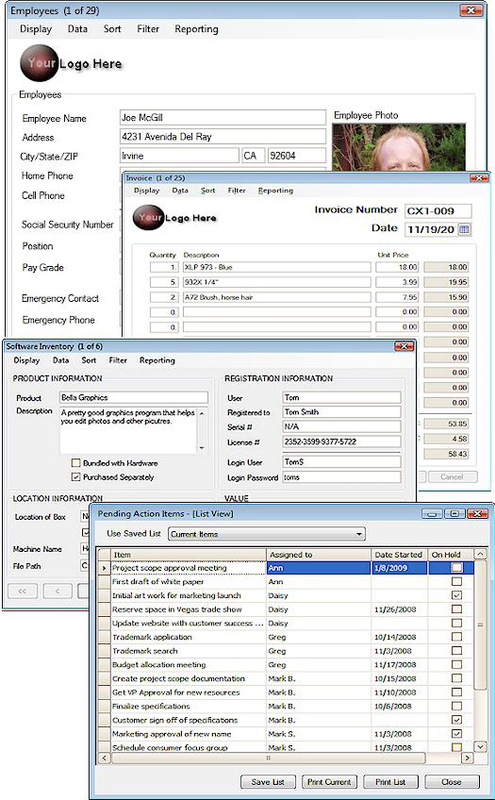 If you run a business, Database Oasis provides support for inventory tracking, client lists, customer payment and contact history, marketing, sales, service, the ability to create custom reports, and support for multiple users! And you'll always be able to perform searches using as little as a single field. It's not an illusion -- it's all of your data in one place! And the name of that place is called Database Oasis! Please note: The Professional version of Database Oasis allows users to search and filter via multiple fields, while the Basic version restricts this to one field. Create your own customized database in minutes, without programming! Implement a database solution for your home or business needs. 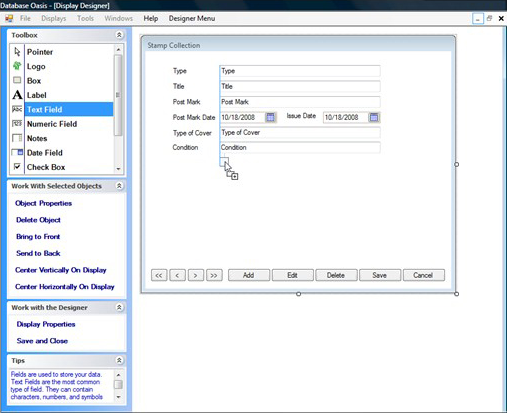 Have the freedom to design your own database using drag-and-drop. Print reports in a variety of formats. Track any kind of data! Perform searches in your database using any field. After you purchase Database Oasis Professional it may be used indefinitely. Database Oasis Professional is licensed per user, so if more people are going to use Database Oasis Professional you will need to purchase additional copies. DH007 Is it possible to export in standalone EXEs? Peter Margol Please could you list improvements (other than the difference between Pro and Basic) since your last offering in April? Last time you promised db links for the next Pro release. Also, why there's no such thing as a Change History page on your website? Kathy Fielder We don't allow stand alone EXEs, however, you are able to create a template file from your design which may be shared with any other Database Oasis users. Kathy Fielder We do have a list of what has changed on our site at http://www.databaseoasis....ement.html. As for the Pro release that includes relational databases, the schedule was delayed, but we are still planning to introduce that feature in the next release. Glen Hilton Looks like the "Free upgrades for minor version" wil be rather short lived. with current V2.97. is it possible to send e-mails, generate MS Word and Excel documents, web-pages, import data from Outlook and directly from web sites? For example, can I add to the program a possibility to automatically import currency rates or generate reports in the Excel format? Or compose a mailmerge? And is data import/ export to Access possible? We don't have integrated e-mail merge. 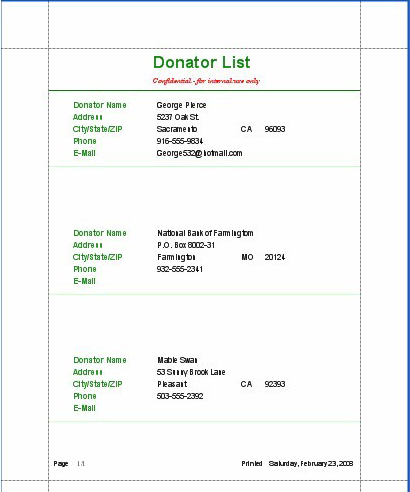 You can export your data to CSV format, which automatically opens in Excel and can be used as a source file for a merge in Word. We allow import from any delimited file format or directly from Excel. Unfortunately, we don't have direct import from Outlook, web sites, or Access. 1. Just to be sure: this offering os for the Professional Version? 2. I do not see too much on the site about creating reports. It is fine to record data, but the importance of the database is the ability to set up and create reports, which will sort through your data and present it in a format which will usually be completely different from the way in which you enter your data. 3. I had trouble seeing most of the video demos. Apart from the first three, the rest were jerky, without sound, and one simply did not play at all. Thanks in advance your your attention. Kathy Fielder 1 - Yes this is Professional Edition. We don't usually run promotions on Pro, but we intend to raise the price when the new version is released, so we wanted to offer one last opportunity to purchase the current version at a significant discount. 2 - We do have a report designer in Professional Edition. If you look at the manual or help file on our Learning Center, there's a chapter on reporting. 3 - I'm sorry about the demos. We're going to redo them for our next release. In the meantime, which one weren't you able to view? Peter Dr Thanks for the reply, Kathy. I will take a look at the Chapter on Reporting, as you suggest. Peter L Downloading demos with chrome works , but it's so terribly slow. Hmm - no previous comments from the last time DB Oasis was offered. In the comments then you had mentioned that an upgrade from Basic to Pro cost $50; your website agrees. I did purchase the Basic version previously; can I purchase Pro at this price and use that to upgrade my Basic version? Or just uninstall/reinstall? What's the best way to do this? BTW my main reason for wanting Pro is that there aren't many printing options in the Basic and you mentioned last time here that Pro has much more in the way of reporting - correct? Ulisses Voulgaris I would be using your software in a desktop pc and a notebook, no network involved, can I do this with the professional license? Can I store the database in dropbox so that the desktop and the notebook use the same data? Technically, there is a different license for upgrading and new installations. If you purchase during the promotion, just send us your purchase confirmation and we'll send you a registration code for the upgrade. Professional does offer a full report designer, so the printing options are much more extensive. George User I cannot reach the "Plimus" web page to purchase Database Oasis Professional for today's special at BitsDuJour. If you need additional assistance, please let us know. We discovered a problem with the Professional Edition contract this morning. You probably hit the site when we were correcting it. Please try again - it should be working now. Bud Gallagher I also own the Basic Edition purchased the last time it was offered here and am considering upgrading to Professional through this offer. However, as mentioned by Glen above am concerned that the current release version 2.97 does not appear have a very long life. Approximately when is the next major release scheduled and what additional costs would a current user expect to pay to upgrade to the new release once it is available. I'm so glad you posted this question here. We got an e-mail from you with this question, but our replies were bounced. Reports respect any filter or sort you have set on the display. Before you run the report, you just need to set a filter for the checkbox equals unchecked. The next version is scheduled for January if all goes well. Although there won't be any additional enhancements to version 2.97, we will continue to support existing customers. We don't normally offer this sort of discount on our Professional Edition. The short life of the product is why we ran the promotion. We are planning to raise the price in V3, so there will be an upgrade fee to reflect the price difference. I don't have the final pricing yet, but as was mentioned, upgrading is not necessary unless you want to take advantage of the additional features. Jim McGowan Thank you Kathy for the info regarding Basic to Pro upgrade. I am concerned, however, about the version changing in only one month and not knowing the price for upgrading at that point. I already purchased the Basic version in April and would be purchasing the Pro version today; if the cost of upgrading to Version 3 in only one month is anything significant at all I'm afraid that I will have paid a hefty price between the three separate purchases (Basic in Apr 2010, Pro in Dec 2010, and Pro Upgrade in Jan 2011)! I could be paying almost as much (or possibly more depending on your price increase next month) than a full Pro purchase would have cost in the first place. Can you at least tell us if the cost of upgrading an existing regular Pro license will be the same or less than the cost of upgrading a discounted Pro license purchased today via Bits DJ? Bud Gallagher Thank you Kathy for the response. Jim I think has asked a very valid question regarding accepting this offer and a month later being asked for an additional update fee. I too would like to know what that upgrade fee will be. Will skipping this offer and upgrading in January be less expensive? What additional features will Version 3 contain? What will make Version 3 a must have upgrade? Unfortunately the pricing hasn't been finalized yet, what I can tell you is that purchasing today from BitsDuJour and then upgrading will be less expensive than upgrading from basic edition to Version 3. As was mentioned in teh other reply it will be less expensive to purchase now and upgrade later than to wait for the new version. Upgrading to Version 3 is also not required so if you dont' want the features there is no additional expense. The main feature enhancements includ relational databases, an enhanced security module, integrated label printing, a report wizard for easier report setup and more. Sorry but I can't make a purchase under such circumstances. Offering a Pro version of a program with the intention of upgrading it in a month or less - but excluding the BDJ purchases - is not how business is usually done at BDJ. Frankly I am surprised that BDJ doesn't have something to say about this. I must pass on this "deal". Edward Atlus I agree with Jim. This is a rediculous offer... almost like a "close out" before the new model is introduced. I've tried Db Oasis before and found the Reporting options to be quite cumbersome. No deal for me on this one... I will look at the new version, but would recommend that you wait next time to post the offer until you can disclose info on the new edition. Bud Gallagher I also am going to pass on the offer for the same reasons Jim memtioned. Most companies offer free upgrades to customers who buy prior to a major release or at least offer an almost free offer to to customers who just bought. Kathy Fielder To the people who were unhappy with the upcoming upgrade, it was not our intention to mislead or trick anyone into a bad deal. As was mentioned, our intention is to continue to support the current version. If you have an issue, we will make sure it is taken care of at no additional charge. The next version will include major functionality changes, which will increase the price. The upgrade charge will be to cover the price difference. If you don't want the new functionality and you're happy with the product you purchased, you can ignore the upgrade.